In several posts now, I have criticized the use of nuclear thermal rocket (NTR) engines. In the case of Earth departure stages, I have shown through mathematical analysis that they either do not have a performance improvement over chemical engines (for the overall system) or that the performance improvement is insufficient to merit the titanic expenditure that would be required to develop them. In the case of a hypothetical Earth-to-orbit application, I have shown that there is simply no hope whatsoever for their use. My writings have elicited strong responses, both here and over on the NSF forum. People have asserted that I am simply wrong, or that I have gone into the analysis with a bias that has somehow compromised my results, or that I have ignored some obscure advanced version of an NTR that they assert can solve the problems that I have identified. Of these criticisms, it is the criticism that my bias compromises my results that troubles me the most. As an engineer, we want to believe that we are immune to opinions and biases but my experience has been that that is not the case at all. They creep into our judgement, and sometimes they sit flat on our face. I have seen for years now at NASA how even the most clever engineers can be seduced or bullied into accepting terrible vehicle designs, and in a perversion of the Stockholm Syndrome, eventually come to “love” the fatally-flawed design that they would have initially rejected. I cannot be certain that my biases do not affect my work, but I am always striving to reduce them as much as possible. The most effective way I have found to do this is to get to “the numbers” as quickly as possible. We can talk all day long about how much better this technology is than that technology, but when we get to the numbers we can begin to improve the signal-to-noise ratio of our discussions more quickly than anything else I know. Let me tell a story about a time when my opinion was changed significantly through solid engineering analysis. When I first got to NASA in 2000, I was part of a study called by a number of different names. Some called it “Decadal Planning”. I thought of it as “go to Mars and back in a year”. Within a few months of getting there, I was running a part of the study looking at propulsion technologies, and we were comparing a number of them. 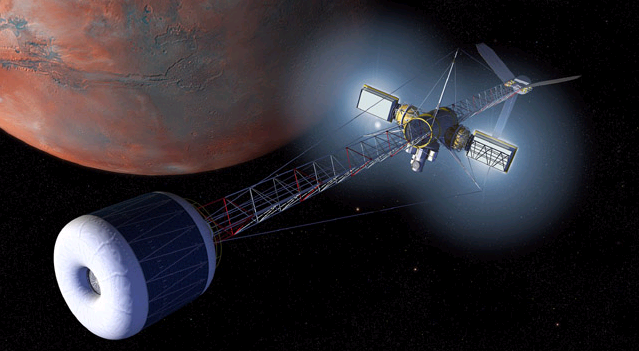 I met a lot of people in the field and began to develop a distaste for nuclear electric propulsion (NEP). The study concluded quietly and in my opinion, was a failure. Some of that was my own fault. But that’s some other post. Near the end of 2002, my boss asked me to be a part of an MSFC response to a JSC study on a new and different NEP vehicle. As I recall they were interested in launch vehicle options. So in January 2003 several of us went to JSC to talk to them. I was very impressed by what they had done. Essentially, they had asked “what are the big barriers towards sending people to Mars?” and then “how do we deal with them?” The biggest barrier they had identified was uncertainty about what happens to people after many years in microgravity. So they decided from the outset to design a vehicle that incorporates artificial gravity, thus cutting the “gordian knot” that had driven previous mission planners to “fast” trip times. My own experience on the one-year-round-trip Mars study had convinced me that it was utterly foolhardy to try to go to Mars and back too quickly. But I know the idea still rattles around in the Internet and is carried by the astrodynamically misinformed. To accomplish the artificial gravity approach, the JSC study anticipated using the natural countermass of the nuclear reactor that would power the NEP vehicle to counterbalance the mass of the inflatable crew habitat. The boom that would be present anyway to keep the reactor away from the crew would now double as the separator needed for artificial gravity. Any time you can get a “two-for-one” value like that in space vehicle design, you want to take it. The persistent problem in the design was the need to point the engines along an inertial direction while the vehicle was rotating. The JSC planners had rejected the idea of rotating slip or roll rings, for good reason and based on their experience with the ISS. To keep the engines body-mounted and yet pointing along an inertial direction required rotating the vehicle in inertial space, nearly 180 degrees during the transit to Mars. Once they got to Mars, the “spiral-in” proved very difficult, since now they would need to move the rotation axis of the vehicle through 360 degrees on every orbit. They came up with a compromise, called “minor-axis rotation” that mitigated some of the issues associated with this maneuver, but I don’t think they were terribly satisfied with it. The design wasn’t complete or perfect, but it was a real step forward. And I was very impressed by their willingness to challenge their pre-conceived notions about Mars travel and examine a design completely different from what they had looked at before. And it changed my mind about the value of nuclear electric propulsion technology. In a future post, I’ll describe how a design innovation I came up with could solve the remaining architectural concerns with the AG-NEP vehicle and make it far more feasible. I understood from the tone of his voice that this decision wasn’t technical, it was strategic. 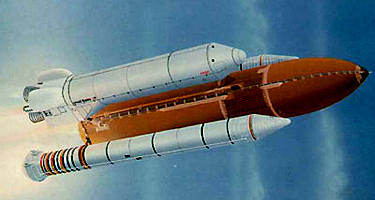 Shuttle-C was based on propulsion hardware developed and controlled at MSFC. If the Mars program went forward, if this vehicle was developed, if Shuttle-C was baselined for its launch, then MSFC would be supporting it for many years to come. I looked over at the other senior person and he was nodding his head in agreement. I looked at the mid-level manager and he wasn’t saying anything. He and I were like enlisted men getting our orders from the officers. And so Shuttle-C it was…the only option we were permitted to present to the JSC study team. As it was, several weeks later the Columbia was destroyed on reentry. Everything changed at the agency and everyone forgot all about Mars studies. But I still remember what I learned and think that there are lessons to draw from it. It’s things like the senior leadership notions expressed at that Denny’s that have frozen NASA for the past 30 years. The best thing that Obama could have done is shoot down Ares project, and let the private sector get a leg up on the means to get humans to orbit. We’ll get much better technology out of it in the long term. With a few years of Orbital and SpaceX technologies, I think that we’ll see them take us back to the Moon as well. be done by a Soyuz, Spacex Dragon, Spacex Dragon cargo with something like a CO2 scrubber, O2 temporarily placed inside or the Boeing crew capsule at a fraction of the cost. Stop the politics, the NASA budget is the same as before so lets have a real vision PLEASE. The rocket part is now off the shelf, it’s time for the “Right Stuff” once again. Jak, think of Orion as a back-up for all those potential commercial capsules. If they all fail, then the “professionals” can ride in to the rescue. If NewSpace succeeds, Orion’s something to cancel to release funding for something else. My understanding is that the JSC team was compelled to think out of the box by the NASA HQ-led NASA Exploration Team exercise. Private companies are not goling so save the U.S. space program. We need to rally around NASA, not hare off into fantasyland. NASA posed an interesting solution to this very problem back in 1994 in tech brief MSC-22021. I found a reference at ntrs.nasa.gov but it doesn’t seem to be online. The idea was that you would fire fixed engines located on a counter-mass opposite the spinning crew quarters so that the thrust was in the direction of the spin axis, while bending the connecting beam by an angle that “dynamically imbalanced” the spinning system by the exact amount needed to balance the reaction to the thrust. When the engines stop firing you reduce the bend angle to zero. Orientation of the spin axis is changed by adjusting the precession of the system. The NEP engines and the nuclear reactor are the counter-mass in this scheme. Six pages of problem statement, all the math, and two diagrams showing how it works. In fact, my copy of this paper has JSC stamped at the top. Don’t tell me they forgot all about it 8 years later? Kirk, is your idea simpler than this one? Why don’t we just find out exactly how much gravity is needed, if it’s needed? As I understand it, a lot of the benefit of artificial gravity can be had by just tightening the bungee-cords on the treadmill (perhaps also increasing the amount of time spent exercising). Isn’t it kind of silly to not even try sending up astronauts for mission lengths equivalent to Mars missions? We have a space station, after all! The Russians have already done this (a 437-day trip), of course. Is it possible that spending much of the day inside a small centrifuge may be adequate, like one that could fit inside the pressurized volume of a large inflatable module? Couldn’t vertigo be reduced by assuming an appropriate posture while in the centrifuge? It seems to me that two of the most pressing issues for Mars missions (radiation and zero-gee) can be relatively easily studied beforehand (on ISS) and most likely can be mitigated to an acceptable risk level without nearly as much complexity as would be required if we didn’t study them. For instance, to help fight zero-gee atrophy, Russians wear resistive suits that make you work your muscles (and bones) when on long missions. Also, we could run an entire mock-Mars mission (including the rigors of landing and launch again) with a module attached to ISS and a short trip to Earth and back. This could give us almost everything we need to know about the risks of zero-gee on a Mars trip. I agree that we should look at our assumptions whenever we find ourselves trying to engineer our way “against the grain” of some equation, like the year-long Mars mission. Another example: what about carbon monoxide for Martian ISRU fuel (which can be straight-away produced by a relatively simple electrolysis cell), instead of Methane (which usually requires everything carbon monoxide production does, plus having to haul liquid hydrogen all the way from Earth)? The problem is, everyone is asking the engineers how to determine the gravity prescription rather than asking the flight surgeons. We’re no longer in the 60s. We don’t need to do experiments on humans, or even rodents.. this is the 21st century.. the genomic revolution is going on. Using microarrays to measure expressed sequences in cells under adverse conditions is a standard part of medical research now. Got a new drug you want to test? Put it in the microarray and measure how much variation in expressed sequences there are from a control group. Unsurprisingly, they’ve already done this on the ISS. So, once again, we have data points at 1g and 0g and nothing in-between. So the answer is simple, send the 1kg payload to the Moon so we can get some data at 0.165-g. It’s not even a round trip.. the unit runs, produces data to be down linked. Chris, and just in-case I wasn’t clear: muscle loss and bone loss are two completely different symptoms of the adaption to zero-g. Regular exercise has been shown to reduce muscle loss. It has also been shown to have no effect on bone loss. So far, nothing has been shown to mitigate bone loss in zero-g. There are quite a lot of drugs that are being tested and for every minor success hope is provided for suffers of bone deterioration diseases, but none of shown the required performance for a Mars mission. And, frankly, treating the symptoms isn’t going to be good enough for the long term colonization of space… unless we are willing to genetically engineer people to live in zero-g, at some point we have to perfect artificial gravity techniques. Nearly 50 years of space of manned space travel, it’s amazing how little experimentation we’ve seen with artificial gravity, that these questions are still unknowns rather than routine. Re:Centripetal Vertigo. I was under the impression that astronauts got over “space sickness” when their brains ignored their vestibular system (to the point of falling down, after returning to Earth, if they close their eyes for too long.) That may mean that much of the vertigo experienced by subjects in Earth-side centrifuge experiments may not even apply to astronauts once they’ve adapted to free-fall. Trent, I totally agree that we should be looking at drugs to help fix this problem instead of just engineering solutions. And exercise DOES actually help some with bone loss, though not as much as hoped. We now have some really powerful drugs that can actually add bone. This is unprecedented. We need to test these drugs right now at ISS and see if their side effects are manageable (I’m betting they are). What this the Decadal Planning Team ? Kirk, maybe I’m completely missing something here, but why not just produce the centrifugal-force artificial gravity during the coast phase on the way to Mars and then transition back to zero-G for the spiral-in? Does the spiral-in MOI take up that much of a significant portion of the mission? 1. A rotating spacecraft is an engineering problem. Bone loss is a medical problem subject to FDA oversight. So do you tackle the relatively straightforward engineering problem involving a single government agency, or an incredibly tangled medical problem involving two government agencies? 2. Scientists spend decades studying drugs in their comfy Earth labs–put orbital launch in their critical path, and those decades change to infinity. As an analogy, which is harder–building a bridge, or curing cancer? I have no doubt the bone-loss problem will be solved in the next few decades, but the answer NOW is not medicine, but rotational artificial gravity. David G., the reason why you don’t want to spin up and spin down the AG-NEP vehicle will be covered in my next post on the topic, where I will describe a solution. We already have bone-adding drugs NOW. A close relative of mine uses them for osteoporosis. Astronauts, like soldiers, are in a somewhat different class than the general population when it comes to what sort of FDA regulations need to be followed. Chris, of course we do. The point is, it takes decades to prove (and rubber-stamp) the efficacy and safety of a drug, over multiple studies of large populations, right here on Earth where everything’s convenient. Making a drug study reliant on spaceflight makes things amazingly harder. Now, in addition to the vast number of hoops held aloft by the FDA, you are waiting years for a slot on a spacecraft; your sample population is way too small for any statistically meaningful result; and you’ve introduced new and poorly understood variables into your development process. And I disagree with the astronauts = soldiers analogy. Astronauts are gold-plated. They aren’t grunts lining up for anthrax shots. It costs (tens of? hundreds of?) millions of dollars to train an astronaut. Unless he is explicitly a guinea pig in a particular experiment, you aren’t going to gamble with the health of what is de facto a national asset, especially if there are psychoactive effects or any other effects that could impact performance during a flight. Take a look at the FAA’s list of drugs prohibited for pilots–it’s a long list. All I’m saying is, engineering is a lot easier than medicine. By all means pursue new drugs, but if you want to solve the problem now, rotate the spacecraft. Astronauts take HUGE risks all the time. I didn’t say that they are the same as soldiers, but soldiers also cost a lot to train, especially the special forces. The kind of risks we are talking about with respect to using FDA-approved drugs (or even any drug approved just for human trials) are significantly less than what they currently experience each mission. Orders of magnitude less. Designing a giant spinning spaceship is also dangerous (any spacecraft is dangerous, making it more complex usually doesn’t decrease its danger). “Solving the problem now” is the kind of thinking that leads to the Apollo cargo-cult architecture of Constellation. It wouldn’t take long to see if these drugs work or not. It just takes initiative. We already have a space station to do _exactly_this_kind_of_research_. I’m frustrated the US hasn’t even had a long-duration mission (i.e. longer than ~6 months) aboard the ISS, yet, while the Russians have done missions lasting over 14 months at a time. Chris, sorry if I ticked you off–I’m really on the same side you are. I’m not talking about “giant spinning spaceships” or calling for Constellation to eat our taxes for the rest of eternity–just the opposite, in fact. I too am frustrated that we have this amazing space station that is deeply under-utilized for science, and one of the prime examples of that is the cancellation of an ISS centrifuge several years ago–caused, if I remember correctly, by Griffin’s Cluster, i.e. Constellation/Ares. Please don’t put words in my mouth. If you read my posts, you can see that I’m not against medical research at all. I just don’t believe NASA should put all its hopes in medical approaches–for which it will never provide adequate budget for testing–while ignoring engineering solutions that could be tested on a small scale, either on ISS or on a free-flying spacecraft. (I mean, come on; put some mice in a bucket and swing it for a few weeks. Then measure their bone density. Repeat, swinging a little faster, etc.) My hope is that SpaceX’s DragonLab will provide exactly the platform researchers can use for experiments that are perennially ignored or underfunded by NASA. Sorry, Patrick, if I gave the impression that I’m angry! I think a (smaller) centrifuge isn’t a horrible idea. I just think that the overhead of using humans (versus machines) needs to be kept as low as possible, and this is an important point. A spinning spacecraft, tons of shielding, or a ridiculous power source that allows 39-day transit times are things that in some cases can be functionally reduced to pill A and pill B (or an injection or diet change, etc). Of course some limited shielding and exercise equipment would be helpful (and really, the crew could be rather bored on the way there and back, so long exercise routines wouldn’t necessarily be bad!). In the same way, closed-loop life support systems should be reduced in size and increased in capability. Also, the capabilities of humans ought to be maximized wherever possible. The space suits used right now are restrictive and have short lives. More flexible space suits (like the EX-1A hard suit or the “space activity suit”, both of which offer GREATLY increased mobility) are also very important, especially once we get to Mars. An astronaut could unroll a very large thin-film solar array with no other deployment mechanism or structural components onto the lunar surface, for instance. Human-compatible power sources (aka solar or RTG… anything not fission or fusion, because of the heavy shielding requirements) also tend to be cheaper and more developed. If there’s a problem with an incompletely unfurled solar array or radiator, a human could fix it (like on Skylab or ISS). Same with a partially unfurled antenna (Galileo, I’m looking at YOU). If you have a highly radioactive power source, then you have to severely limit what humans can fix on an EVA, ESPECIALLY when the reactor is running. Living things can be rather resilient and adaptable. We need to capitalize on this if we’re going to do human spaceflight at all.